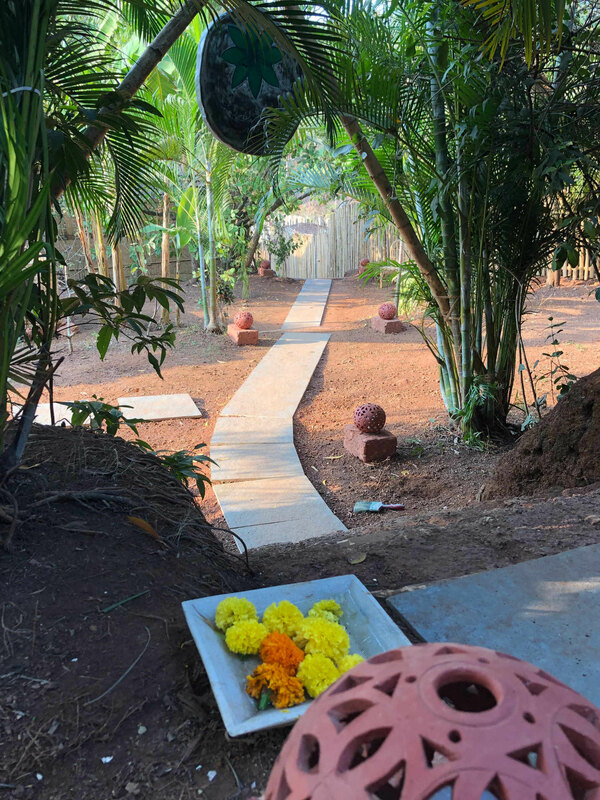 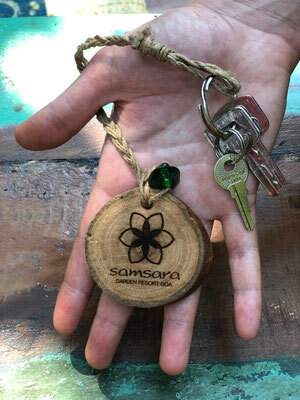 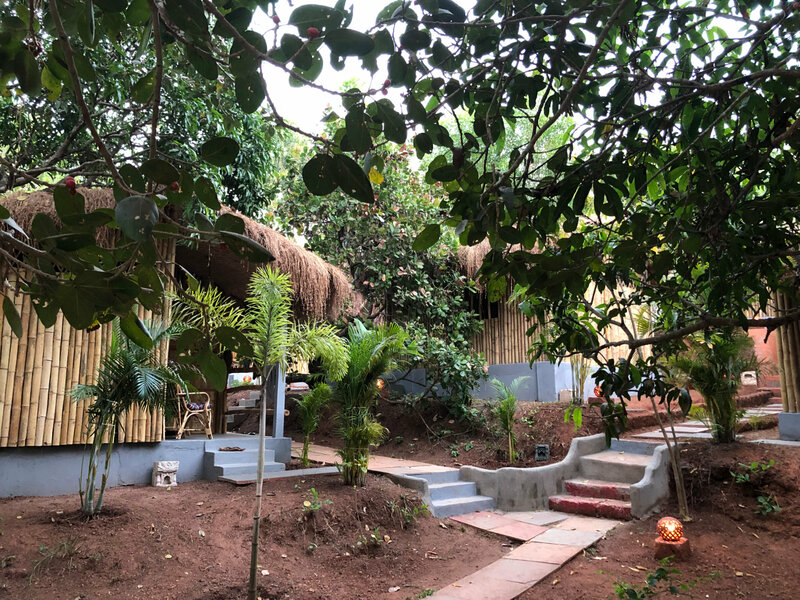 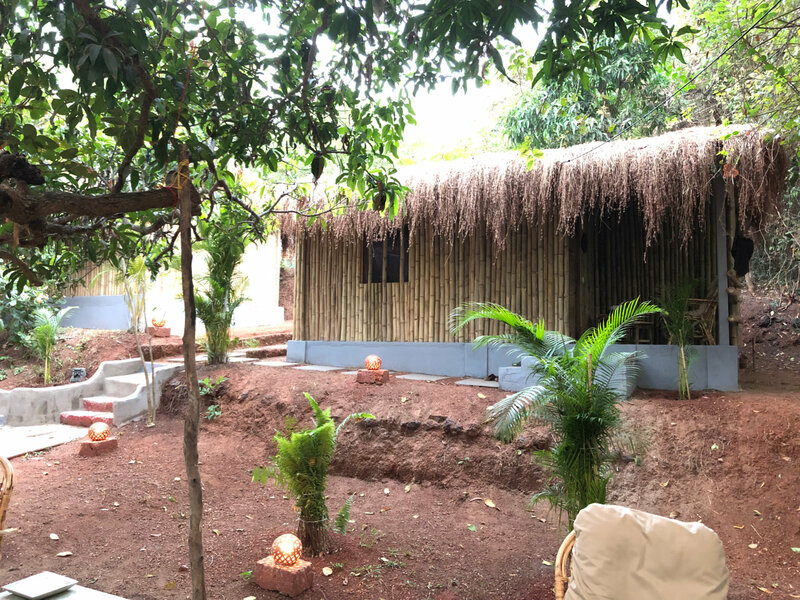 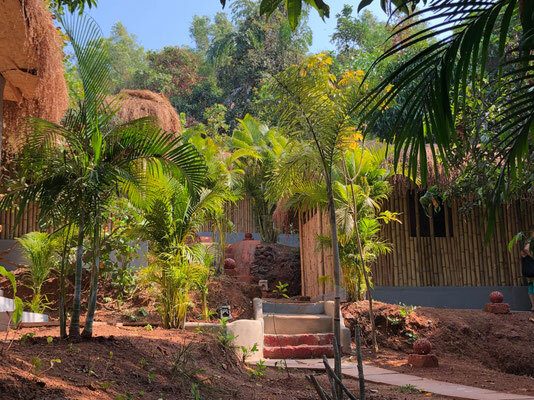 Samsara Garden Resort is a cosy resort featuring 11 bungalows placed in a lush garden - only 800 meters from Ashvem Beach, Goa, on the coast of the Arabian Sea. 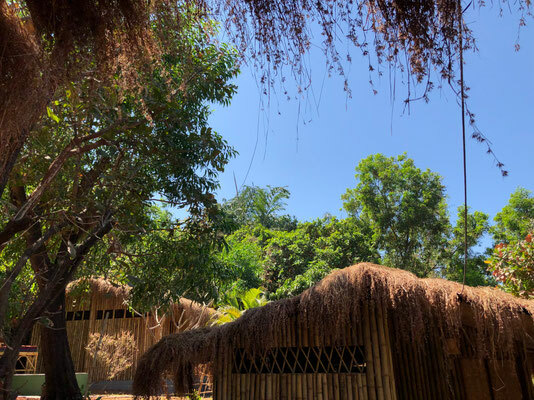 The 4000 square meter large property is a beautiful place to relax, celebrate, come together, and spend a wonderful time recharging your batteries! We can host up to 19 people and offer different packages depending on your group’s needs. 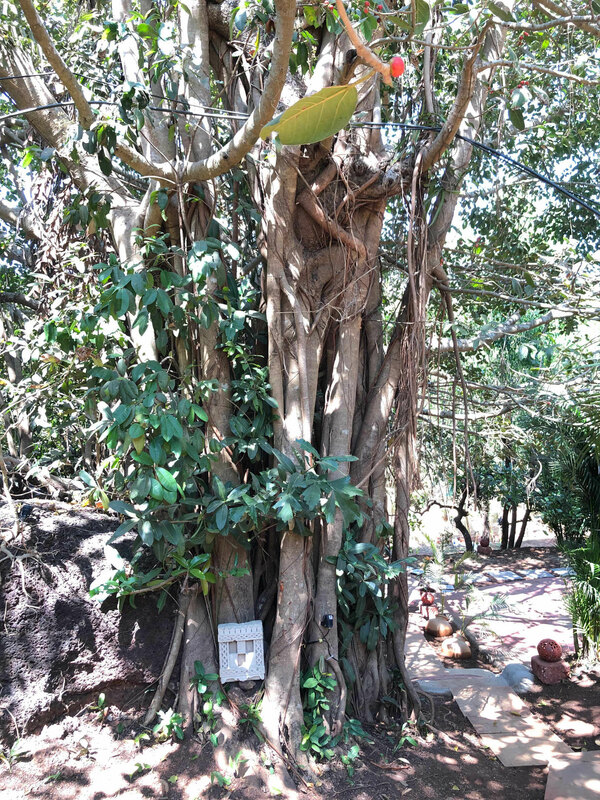 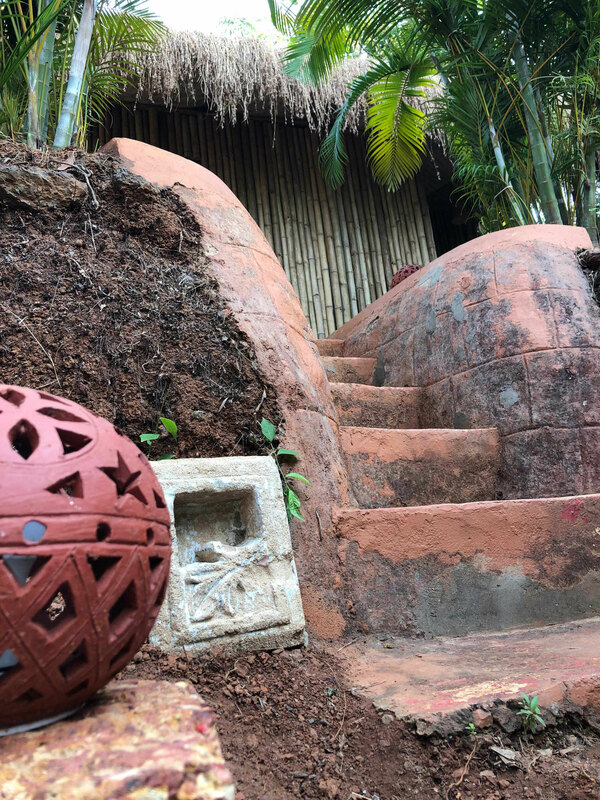 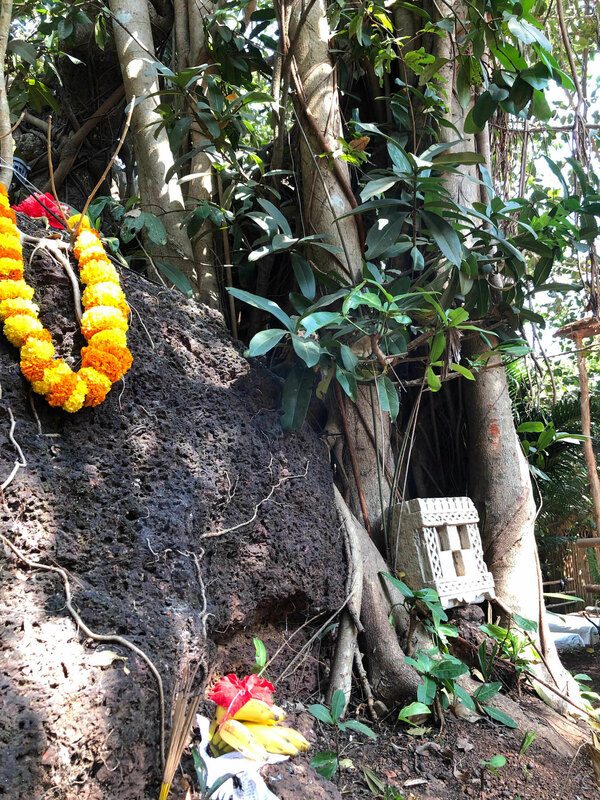 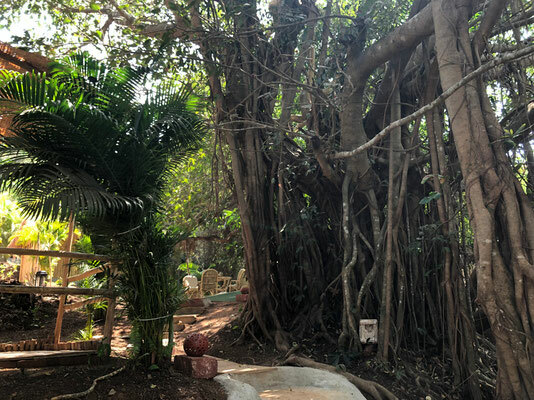 A 400 years old sacred Banyan Tree forms the heart of the place, it is located right next to our Yoga Shala, which can fit up to 30 students on mats. 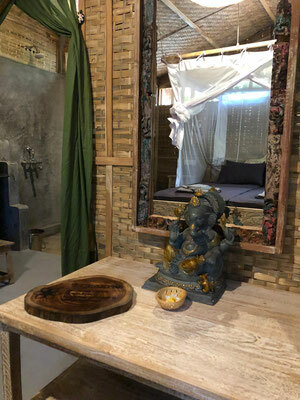 The space is perfect for practicing yoga, making music, dancing, and other activities. 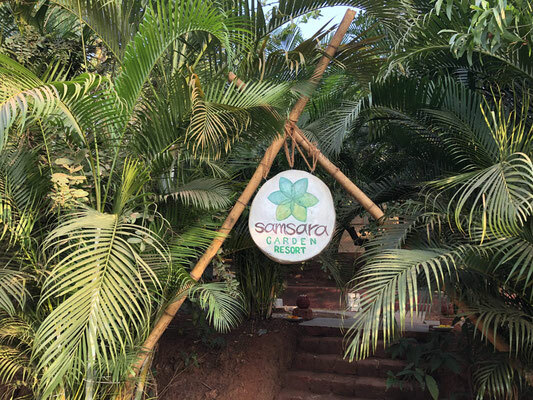 Our resort can be rented for retreats, group activities, or a family and friends holiday. 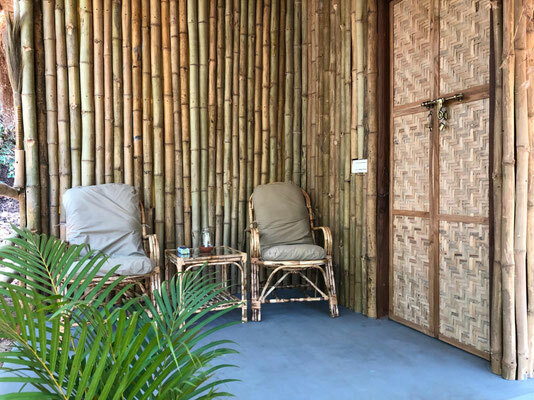 Welcome to your "home away from home“, in peaceful, tropical paradise! Contact us for rates, booking, scheduling! We are looking forward to create a magical time for you and your group! 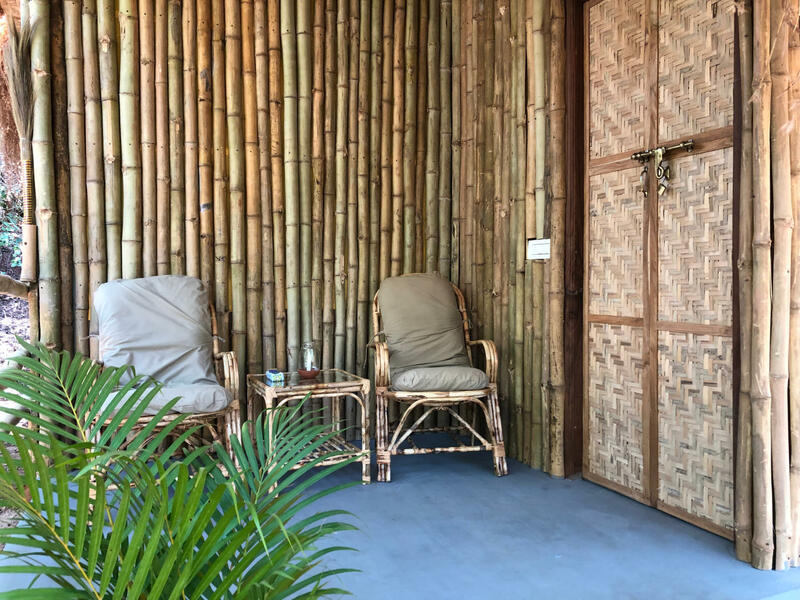 Our bungalows are built with natural materials and equipped with wooden furniture from Rajasthan. 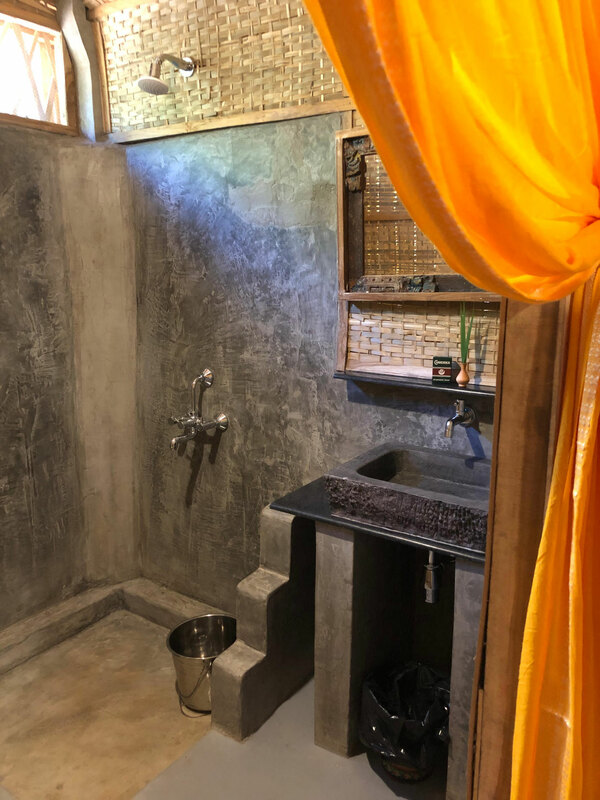 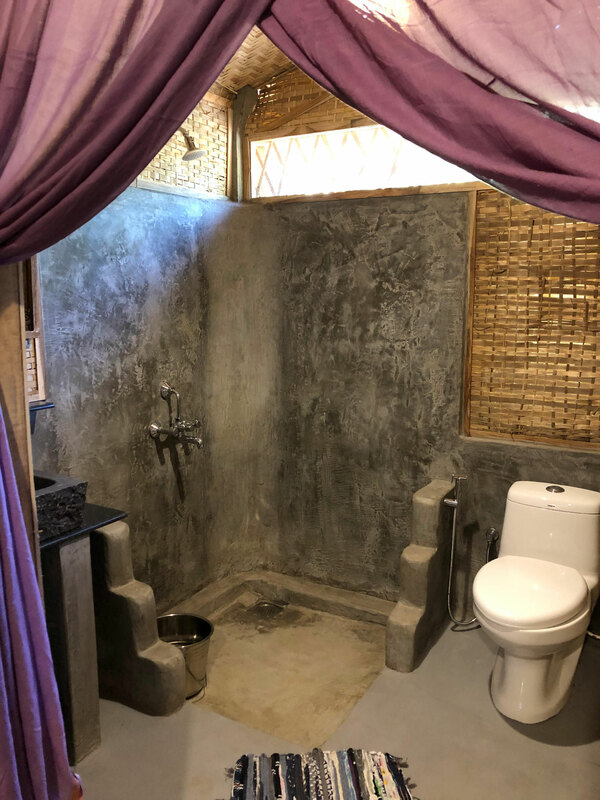 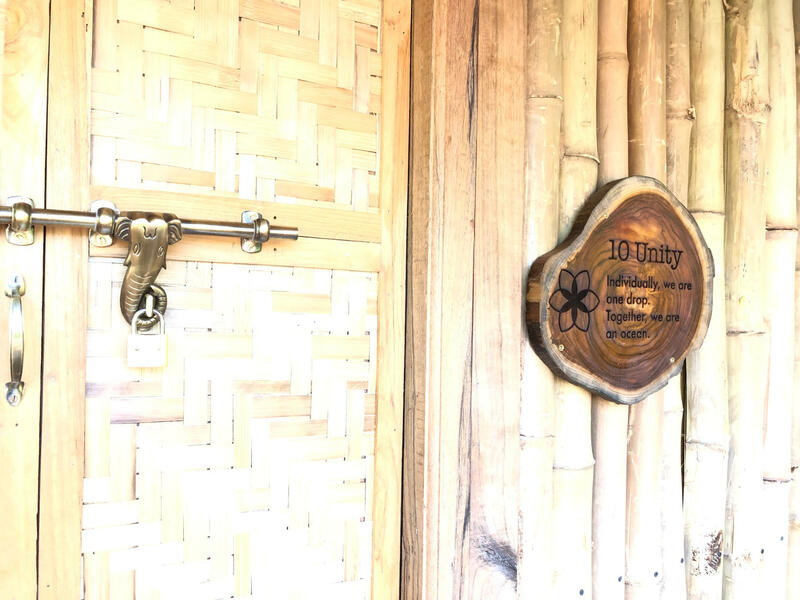 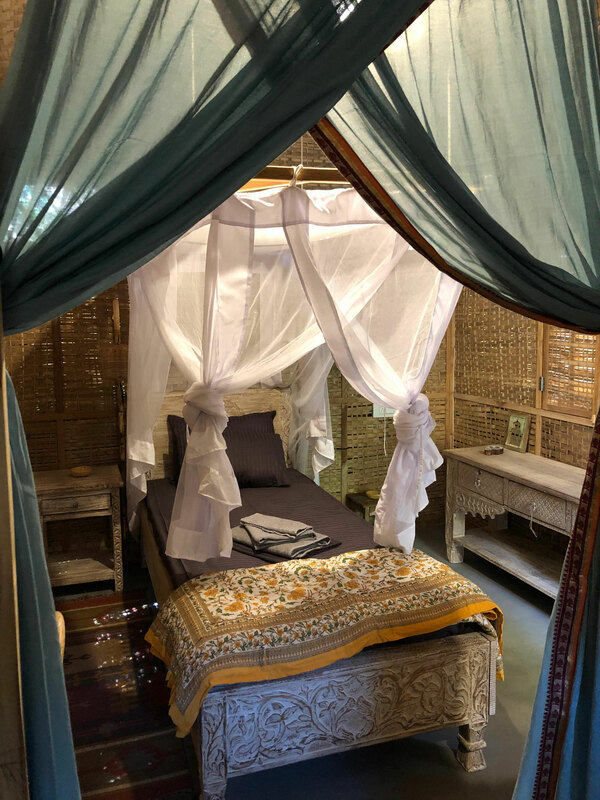 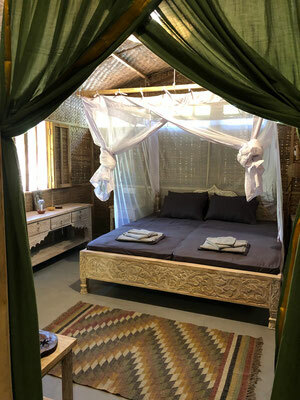 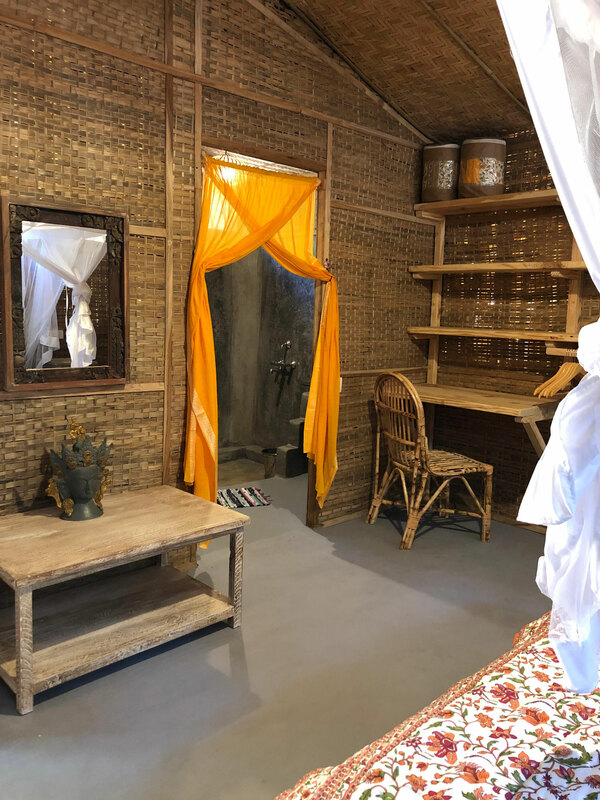 Each hut has its own magic - and additionally to that also a bathroom with shower and a terrace, where you can spend hours watching the trees and listening to the birds! Hot running water is available and heated by our solar plant. 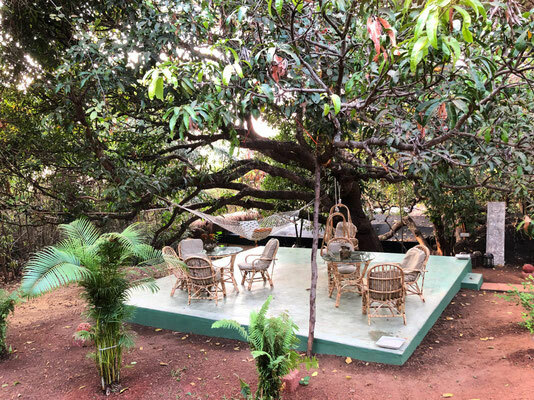 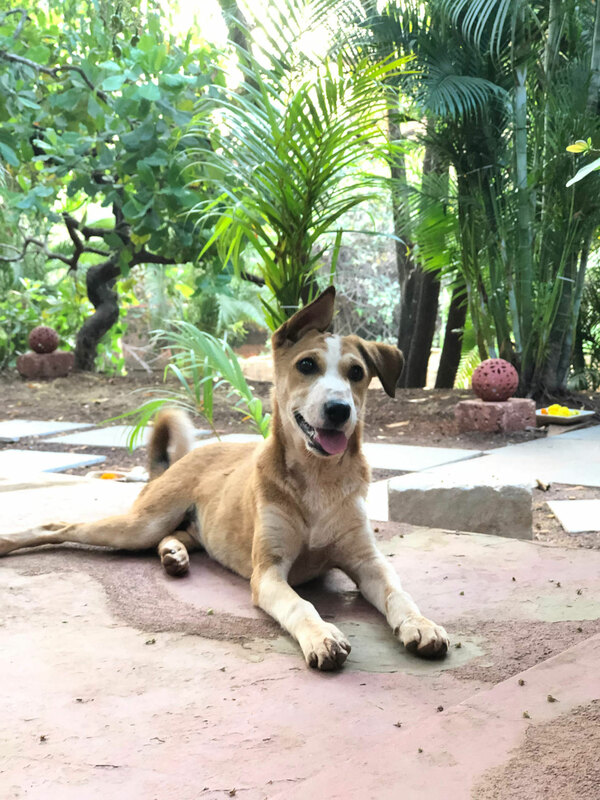 The surrounding tropical forest creates an out-of-this-world relaxing atmosphere, sunlight breaking through the leafs of old mango and cashew trees, which spend a welcoming shade during the midday heat. 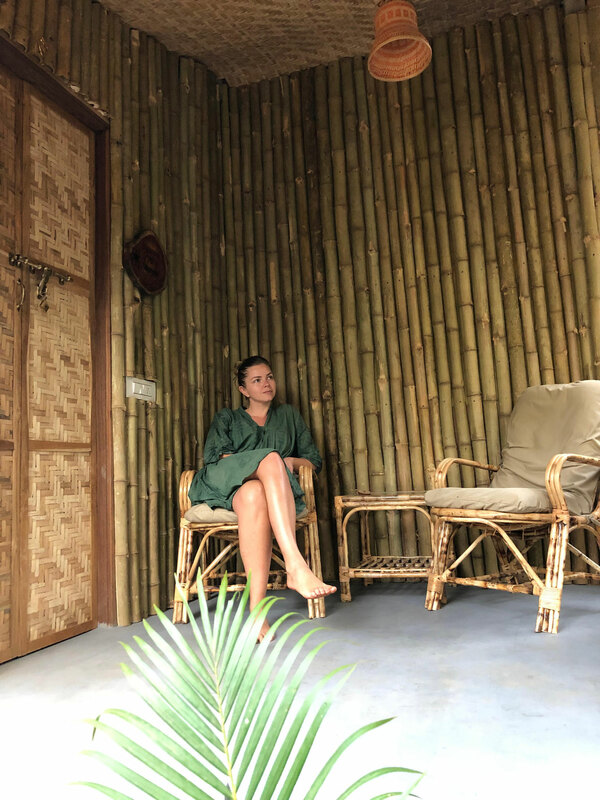 Luxury for us means having everything you need, being surrounded by beautiful nature - not missing the unnecessary things you know from home. 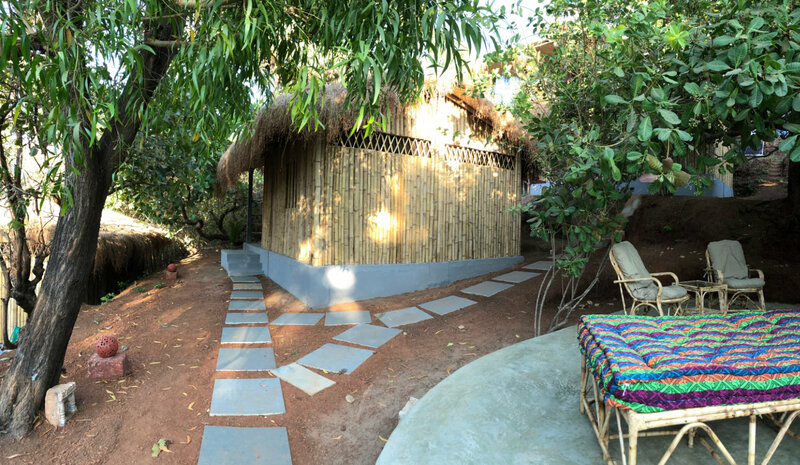 We have 3 single huts with terrace, 7 double huts with terrace, and 1 luxury double hut with a rooftop terrace. We can host up to 19 people. 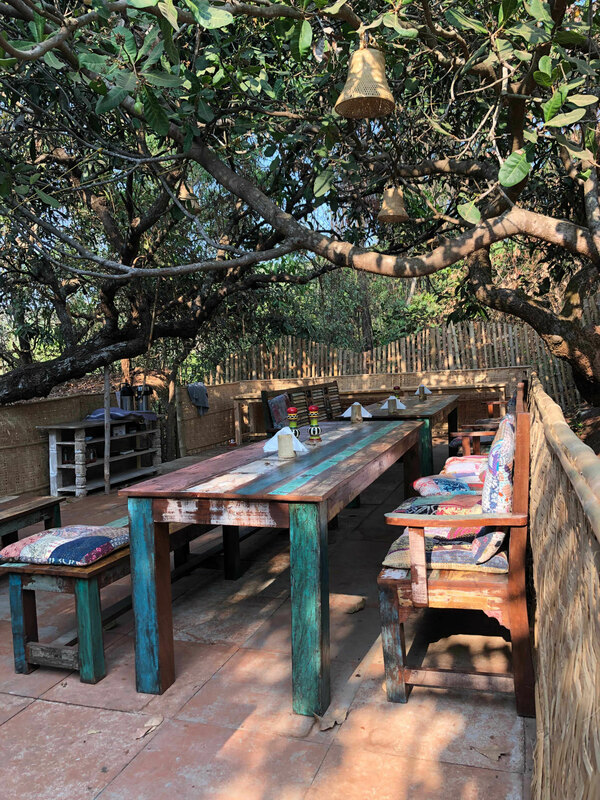 Our vegetarian ayurvedic kitchen is able to offer different options to meet your group’s needs. The rental can be booked with full board, half board, or breakfast only. 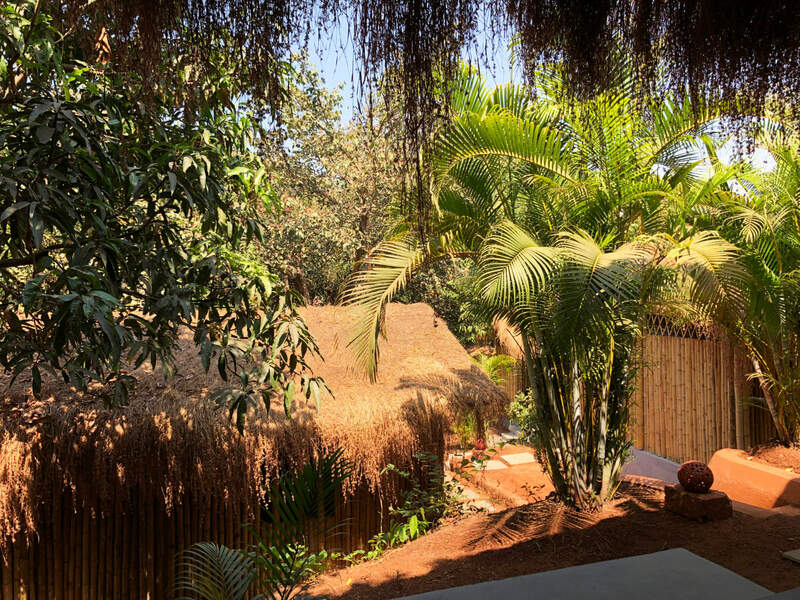 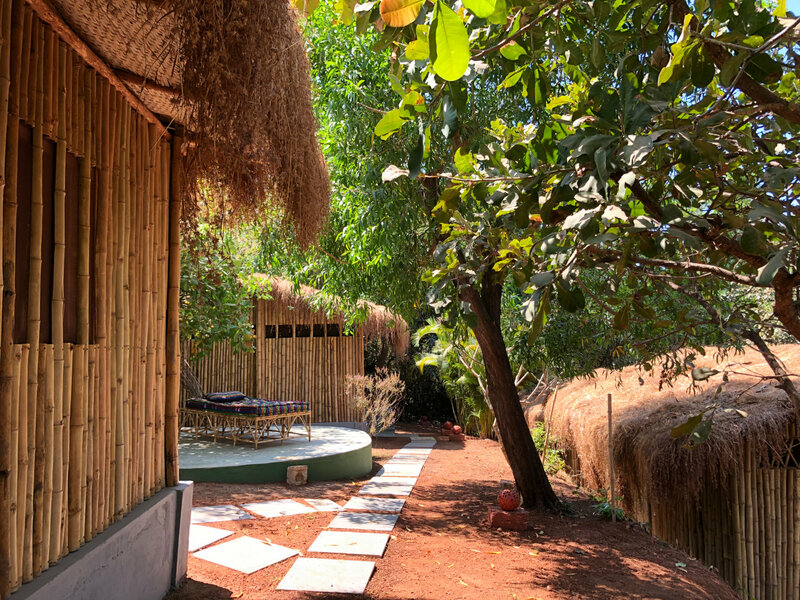 Included is our beautiful Yoga Shala, lying under amazing old trees which keep it cool during the day. This place is designed for community, connection, self discovery, meditation, dance, celebration and contemplation! 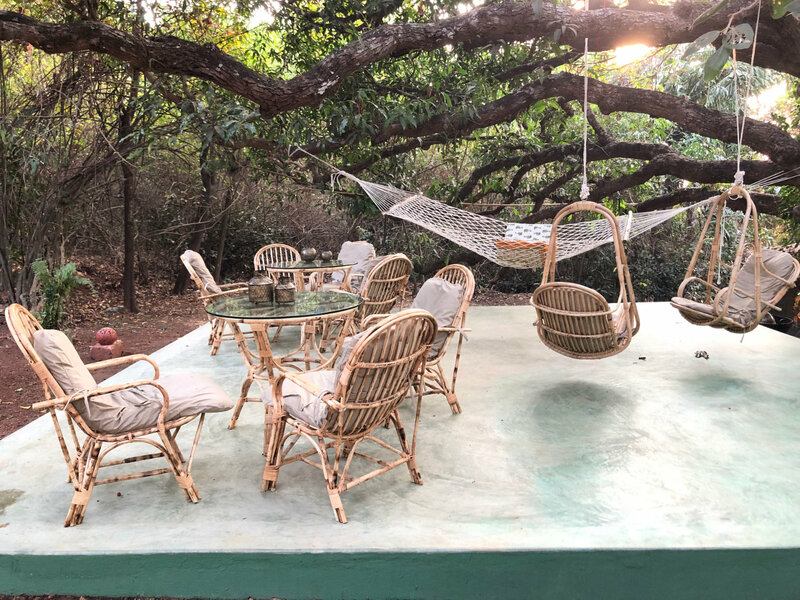 Two other platforms invite you to come together or spend some quality time in the hammock watching the birds and chipmunks in the old trees above you. 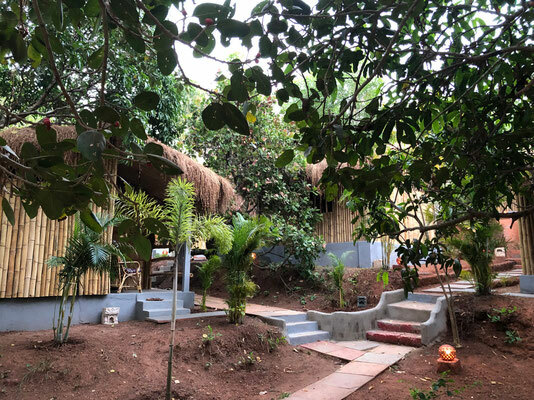 International and domestic flights arrive at Dabolim airport in Goa. 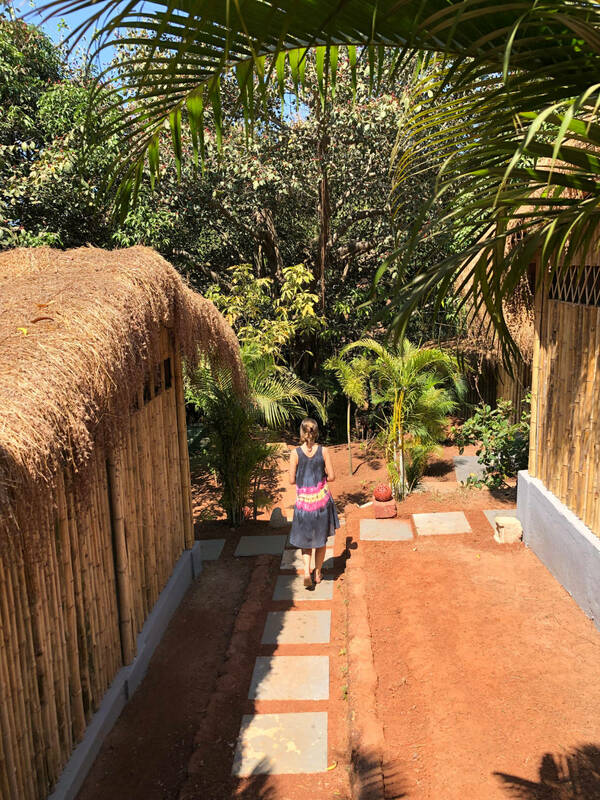 If you would like us to arrange airport transfers for you, please ask for this service during the booking process! 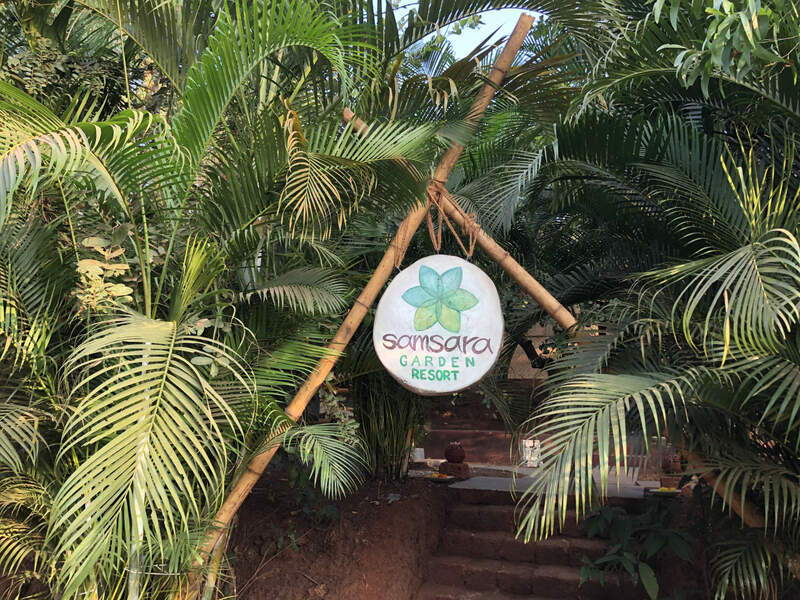 The drive from Goa Dabolim Airport to Samsara Garden Resort takes approximately 1 hour 20 minutes. The closest large town is Mapusa, an about 30 minutes drive from us. 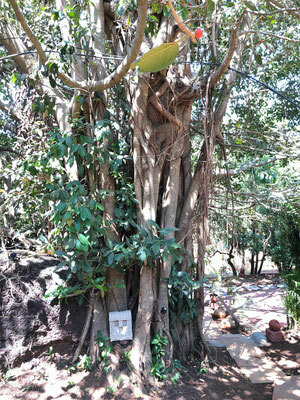 Mapusa has bus connections to Mumbai, Bangalore, Mysore, Pune, and other tourist destinations. Goa has two main railway stations, Margao and Vasco da Gama, an approximately 1 hour 20 minutes drive from us.